The Chelmer and Blackwater Navigation is a secluded waterway running approximately 14 miles between the city of Chelmsford and the sea lock at Heybridge Basin (on the Blackwater Estuary). 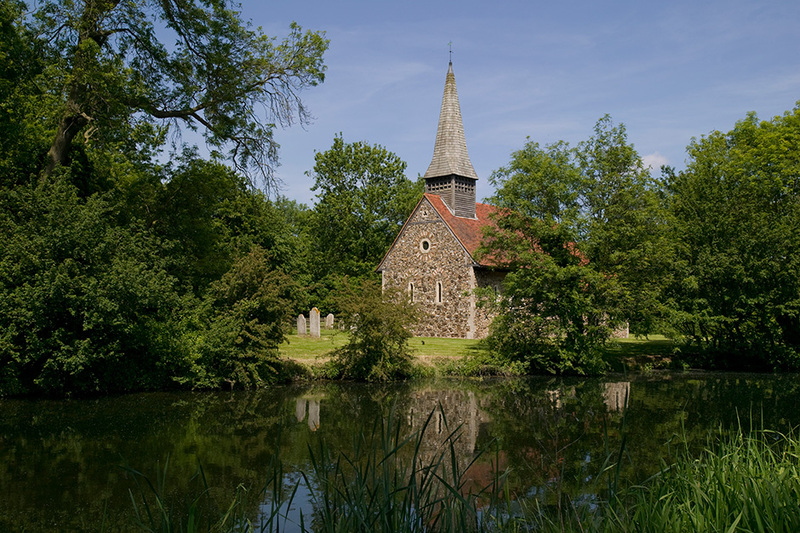 It follows the route of the narrow River Chelmer and meanders through some beautiful and unspoilt Essex countryside. Twelve working locks enable navigation of the 23 metre drop to sea level and there is a well maintained tow path along its length. Many people who live close to it do not even know it is there! 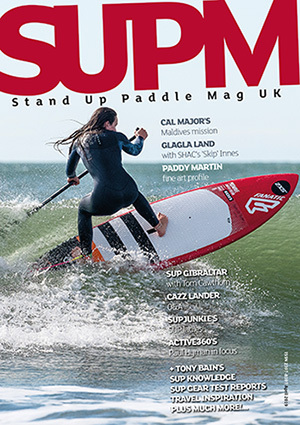 Anni and Mike Ridsill Smith give us the low down on this hidden SUP treasure. We run a stand up paddle board school called Frangipani SUP on the navigation, where we teach beginners and run our SUP HUB, SUP Senoritas sessions and SUP Explores. Frangipani flowers (Plumeria) do not grow here but many other varieties of flowers thrive. 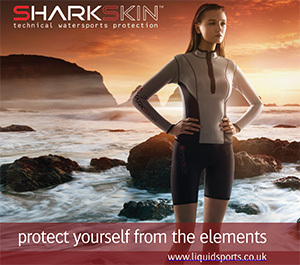 Our friends from Wet ‘n’ Dry SUP in Leigh-on-Sea also use the navigation to teach beginners and have club paddles. An Act of Parliament in 1793 launched the start of the navigation’s rich and vibrant commercial history, which spanned nearly 200 years. Thousands of tonnes of cargo, such as wood and coal, were loaded onto barges from foreign ships and horse drawn along the waterway to the city. Today the hustle and bustle of commerce and trade has been replaced by the peace and tranquillity of the natural environment. 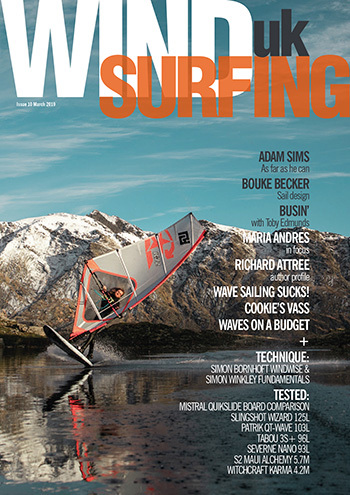 It is now a fondly loved place of recreation for a host of users, with SUP boarders having joined the friendly and diverse river community in recent years. Unlike many of our country’s inland waterways, the Chelmer and Blackwater Navigation was not nationalised last century but instead has always maintained its independence. Following the threat of closure in 2005 it was put into the competent managerial hands of Essex Waterways Limited, part of the Inland Waterways Association. The company’s small team of managers, residential caretakers, lengthsmen and volunteers work tirelessly all year to keep the navigation open and its user’s safe, supported by the work of the Chelmer Canal Trust. 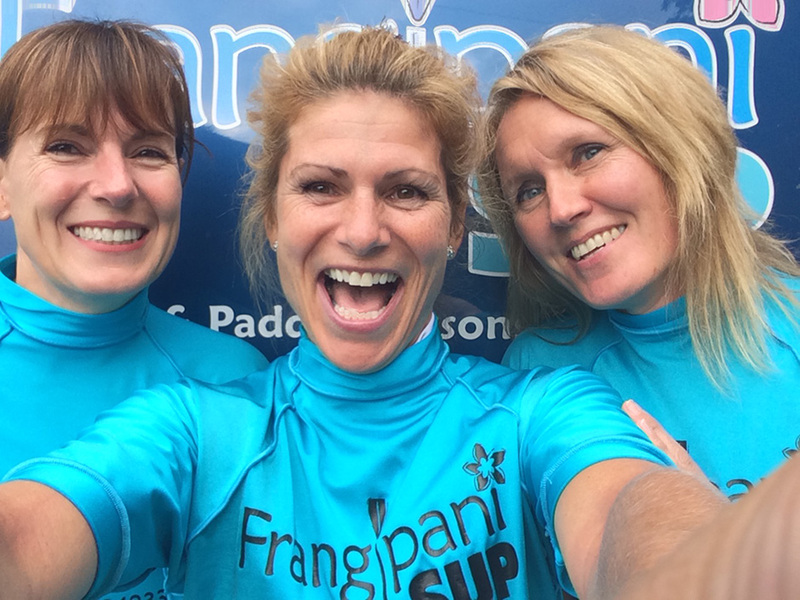 These folks have all been extremely supportive to us at Frangipani SUP, helping and encouraging us with our stand-up paddle board school. 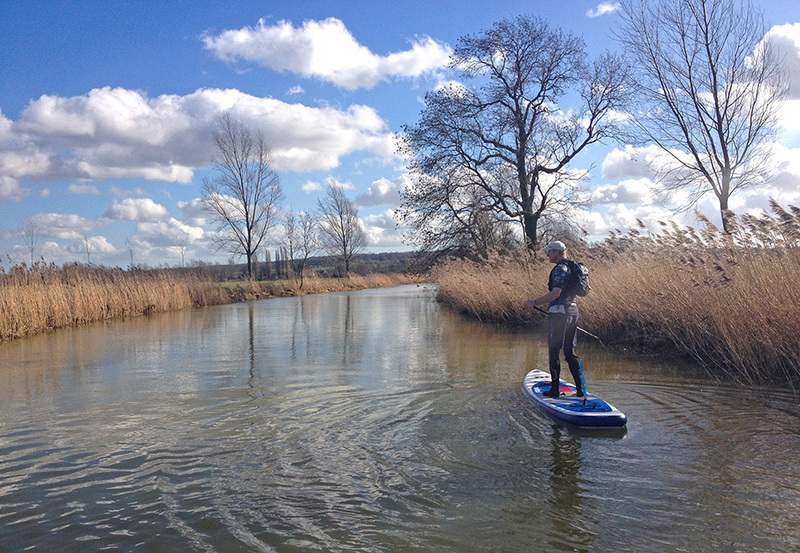 From a SUP perspective the navigation provides a wonderful place to paddle and explore, being both safe and sheltered and offering an amazing variety of things to see over its 14 miles. It is best to take your time and enjoy every inch of it as you paddle towards your ultimate goal, be that a large piece of cake and cup of tea at the busy halfway point at The Old Stable Tearooms at Paper Mill Lock or the summer campsite at Hoe Mill Lock (you need to book) or the sea lock at the quaint Heybridge Basin, where two pubs and a tearoom await you. Or you may be training hard in which case you will not have much time for sightseeing or cake eating! 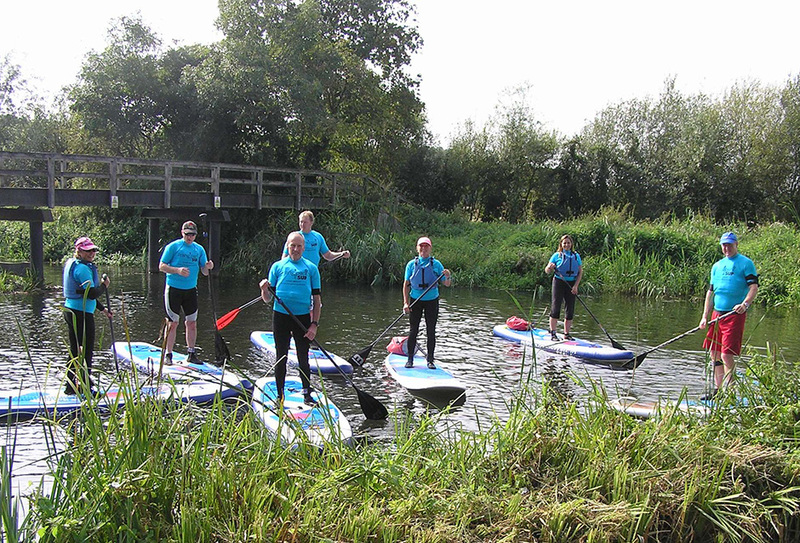 Starting our SUP journey we paddle downstream from Springfield Basin in central Chelmsford, where we feel a real sense of urban connection, with the buzz of traffic and humdrum of daily city life encircling us. Old wharf buildings have been regenerated to create smart new residences and shops and businesses thrive. Then, as we glide through the water meadows on the edge of the city, the cacophony starts to fade and we ponder the route ahead. Paddling on we quickly reach the lock at Barnes Mill, where corn was milled since Saxon times. Further still we will pass under Bundocks Bridge (a surviving John Rennie design) towards Sandford Lock, next to Sandford Mill which houses a museum celebrating local industrial heritage. Sandford Lock is home to an active boating club and a small local business called Blackwater Boats, whose owners have been taking day-trippers on river cruises for over 20 years. Heading downstream we will next portage our boards at Cuton Lock and then paddle onto Stonhams Lock. In our opinion this marks the start of the most beautiful stretch of the waterway as it runs through reed beds, arable fields, past Ulting Church and through several more locks and weirs to meet the tidal waters of Blackwater Estuary. One of these locks is called Hoe Mill and it is our beloved SUP teaching home, situated in a very rural, tranquil and beautiful stretch of the river. Frangipani SUP beginners take to the water after a safety briefing and land drills on an island, to master knee paddling in the lower mill stream. Once standing they paddle gingerly downstream towards Sugar Bakers’ cottages, named after the sugar bakers’ holes where sugar was first extracted from beet using fire pits. These nervous and wobbly paddlers are often rewarded with a startling glimpse of colour as the resident kingfishers busy themselves or we reach the beautiful water lily beds. Okay, enough about our office! Let’s paddle on downstream from Hoe Mill Lock until we reach Beeleigh Lock and Falls, an area of natural beauty with wonderful reed beds, herons and egrets. If the tide is right it is possible to leave the navigation here and paddle on the upper reaches of the tidal estuary to Maldon (a small historical maritime town which is home to many Thames barges). But let’s stay on the navigation and enter the very interesting Long Pond, a purpose-built man-made stretch taking us to the sea lock. As we arrive back in urban territory we pass by Maldon Golf Club and then paddle past houses, factories, shops and offices. Leaving the town behind us the atmosphere changes again as we head towards the salt marshes and mudflats of the Blackwater Estuary. Finally, as we glide into Heybridge Basin, we glimpse the imposing gates of the sea lock, beyond which lay the Blackwater Estuary… and the world.